I have a problem. In my website instagram feed not showing, and admin site appears “Feed Them Social (Notice visible to Admin only). 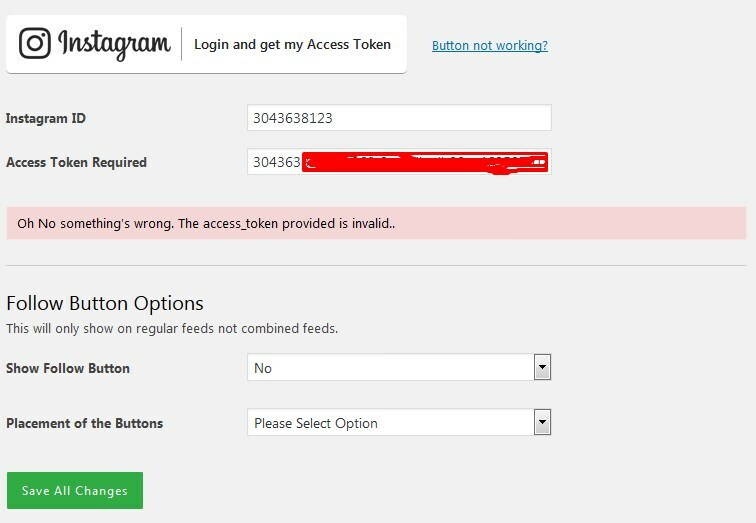 Instagram returned: Please go to the Instagram Options page of our plugin a double check your Instagram ID matches the one used in your shortcode on this page.” how to fix this? Sorry for the troubles! Try going to your instagram account and then click the settings gear icon so you see the popup of options. Now click on the Authorized Apps option. Once on the next page click Revoke Access under the Feed Them Social App. Now go back to the Instagram Options page in our plugin and click the button to get a new access token. Thank you for responding to the question and on his advice, I will try it first. I’ve tried it like your suggestion and the results are still the same. I also attach the results of screnshoot from this plugin. Make sure after clicking the button to get an access token that you are clicking save all changes button at the bottom of the page. Awesome, that is good news! If you have a second and wouldn’t mind leaving a review for us, we would be very grateful.